Thank You, Lord, for this beautiful day, so full of love, unity and peace! I feel so grateful and honored to be a redeemed child of the most High God. I am born of the incorruptible seed of the Word of God! Thank You for sending Your precious son, Jesus, to die for me, so that the abundant life I live will only get better and better, with each passing day. Declaration: I declare that Your favor is upon me. I am an ambassador of Christ and will continue spread the Good News to all that I meet. Matthew 28:19 Go therefore and make disciples of all the nations, baptizing them in the name of the Father and of the Son and of the Holy Spirit. Father, I know that I am a special person, recreated in Christ Jesus, that I will do the great things that You have prepared for me. I pray that as continue in my walk with You, I will also be a blessing to those I meet today. Let the light and love of Jesus shine so brightly within me that on the outside it will illuminate for all to see. I want to be that person, Lord, who others can look at and just know that Christ lives in me. I also pray that I will be bold enough to give a word of encouragement or even just a smile to the strangers who cross my path. May I truly be a blessing to those I encounter along my life’s journey. Luke 6:38 – Give, and it will be given to you: good measure, pressed down, shaken together, and running over will be put into your bosom. For with the same measure that you use, it will be measured back to you. 2 Corinthians 5:20 – Now then, we are ambassadors for Christ, as though God were pleading through us. We implore you on Christ’s behalf, be reconciled to God. Almighty God, may I continue to hear the Holy Spirit as He guides and counsels me. In all situations, help me to be obedient! Master of the Universe, my Protector, my God, in whom I confidently trust, hear my prayer. In Jesus’ mighty name, SO BE IT… Amen and Amen! Ephesians 2:10 – For we are God’s masterpiece. He has created us anew in Christ Jesus, so we can do the good things he planned for us long ago. 1 Peter 1:22 – You were cleansed from your sins when you obeyed the truth. So now you must show sincere love to each other as brothers and sisters. Love each other deeply with all your heart. Prayer: For All Things Give Thanks! A Prayer of Gratitude – Thank You! I praise and give You thanks my dear Heavenly Father. 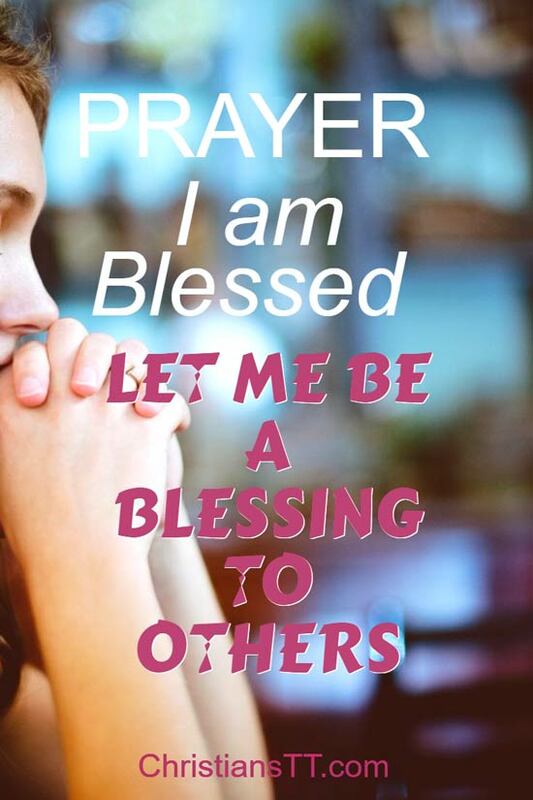 I know that I am blessed I want to be a blessings to others,what’s a great joy for me. Let the light and love of Jesus shine within me. Thank you Lord,for Your favor is upon me today and always. Thank You!!! May the Almighty continue to equip you and use you in opening the eyes of the multitudes to know who and what they are in Christ Jesus, to know that they are His battle axes, His weapons of war, His end-time warriors and instruments of His perfect Will. I give thanks to my dear Heavenly Father,for today,this beautiful bless morning. I am recreated in Jesus Christ,that I will do great things,that You have prepared for me. I pray that today,as I continue to walk with my Lord God Jesus Christ.I am Blessed. So that today I will also be a blessing to those I meet today. Let the light and love of Jesus Christ,our Lord,shine within me. Thank you so much for this wonderful prayer. In Jesus mighty name I pray. Father I thank you for I know you will make me to be a blessing to others. Lord Jesus Christ I live for you all the days of my life. Help me to touch lives on daily basis for your glory. Thank you for purchasing me with your blood Lord Jesus. Lord I give you thanks and Praises for all what you have done for me and my family, and continues to lay your blessings upon us .Jesus you are our healer. Thank you father for bringing back to you, I was lost but you found me. Thank you Lord for everything you have done for me. Let me be a blessing to other people who will see your glory in me and come unto you. Shine your light through me Lord in Jesus mighty name. Jesus, help me to change career if it is in your will. Dear Jesus, I pray that as each of us comes to a point in our lives where we dare to ask you to reveal your will for us, you would put us in a place of acceptance of what you reveal to us. My Blessing today was earned….I was criticized for ‘PUSHING’ my faith. My descriptive name in chat rooms for Google+ is JesusLuvsU2. Someone said I shouldn’t be ‘pushing’ my faith. I defended my station, got angry, asked God via Jesus to forgive me and hen the Holy Spirit reminded me that Those who are persecuted for their faith are ‘blessed.’ <(paraphrased.) Thank you Lord for your 'wall'(SHIELD)) OF PROTECTION. amen.